The alert comes in Europol's annual Internet Organised Crime Threat Assessment report. "The possibility of compromising NFC [near field communication] transactions was explored by academia years ago, and it appears that fraudsters have finally made progress in the area," the report says. "Several vendors in the dark net offer software that uploads compromised card data on to Android phones in order to make payments at any stores accepting NFC payments." The report's authors add that one consequence of the novel crime is that shops might not know how to react even if they detect the deceit. "Currently, when merchants detect a fraudulent transaction, they are requested to seize the card," the report says. "However, the confiscation may not be feasible when the compromised card data are recorded on the buyer's smartphone." The report concludes that smartphone and touchless payment terminal manufacturers should "take action to design out security flaws". Europol is the EU's law enforcement agency, which helps members states' police forces co-ordinate operations and intelligence. Its report is intended to flag emerging cybercrime threats. One of the body's advisers acknowledged that investigators were still unclear whether the payments were triggered being by customised apps or via Google's own Android Pay software. "It's anecdotal evidence at the moment - it could be either or both," said Prof Alan Woodward, from Surrey University. "But whatever the case, evidence that it is happening is mounting." Prof Woodward said the criminals were probably using Android handsets rather than iPhones because Google did not prevent third-party apps using a device's NFC chip, but Apple did. "Apple systems are locked down, but you can typically write code to get at NFC, wi-fi and Bluetooth on Android-based devices," he said. "It's just easier to write things on there if what you are doing is pretending to be a contactless card or otherwise sending communications to a contactless payment terminal." Prof Woodward added that the threat did not mean people should stop using Android Pay, but rather that all members of the public should remain vigilant against unusual transactions. 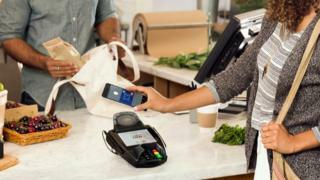 A spokeswoman for Google said: "Security is at the centre of Android Pay; we verify cardholders' identities with banks before enabling them on Android Pay, and we work closely with our banking and payments partners to suspend fraudulent cards." Android Pay in UK: A tipping point for mobile payments?